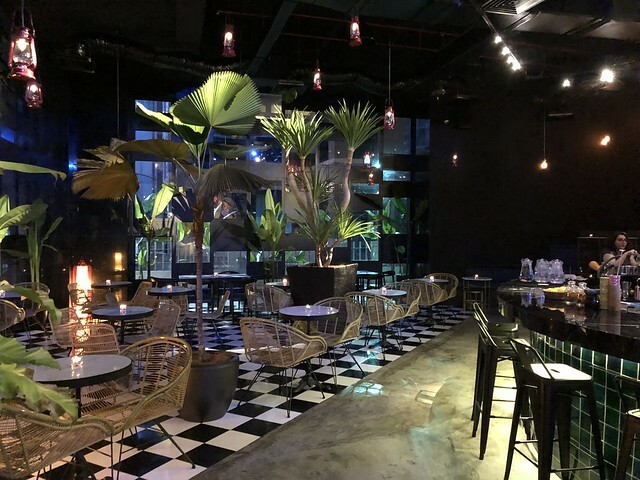 Beta Restobar, KL is definitely one of the coolest places to eat in year 2018. 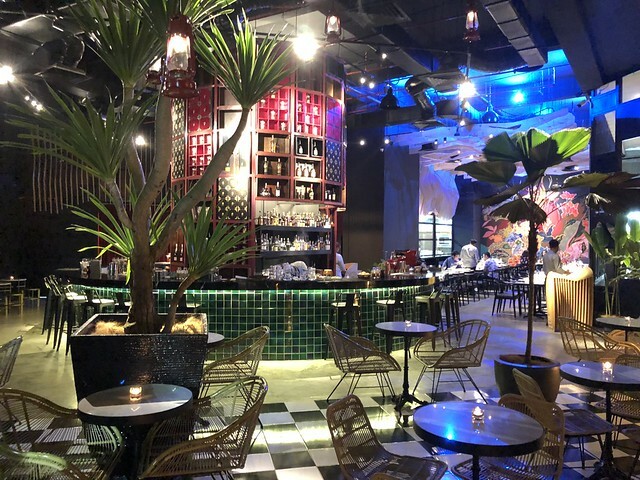 This restobar is embracing the diverse flavours of Malaysian cuisne by showcasing flavours from 4 different regions from Malaysia – North, South East and Central. 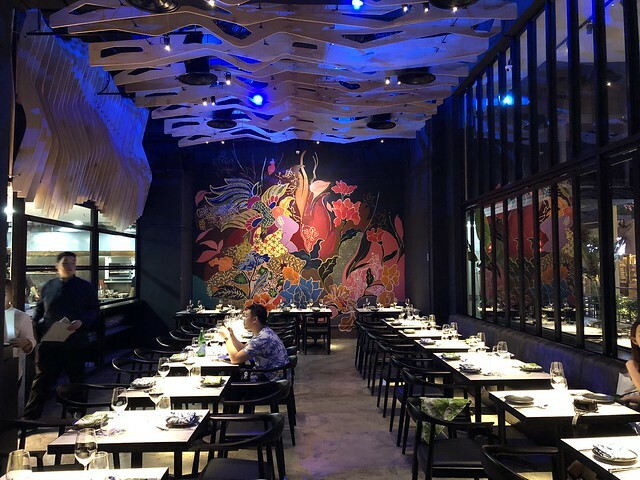 It is manned by the same team behind Skillet @ 163 and I really like their bold move to go into modern Malaysian cuisine. Located in Fraser’s Place, Beta Restobar is at another end of its sister restaurant, Skillet @ 163. It is a big, sprawling space divided into four distinctive areas. As you push through the red door, the first thing you will see is the wraparound bar with something like an antique chinese cabinet. To the right is an elevated seating area meant for a drink or two. 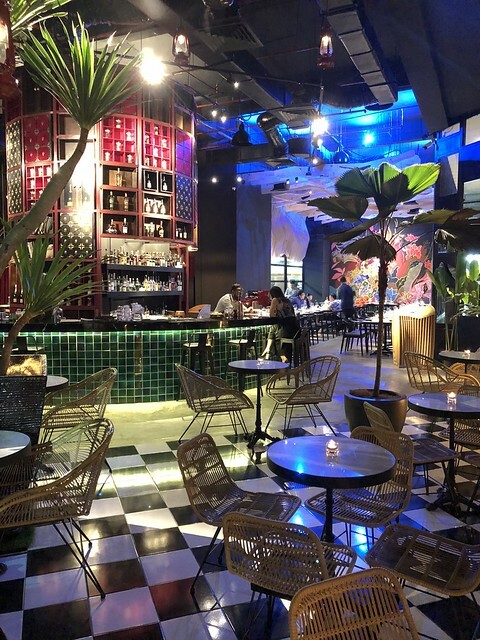 My favourite area is beautifully fitted with everything tropical: checkered floors, rattan chairs, and leafy plants. The main dining area is where you get to see the chef in action from the open kitchen. The mural in batik print is an unique piece too. Beta Restobar’s cocktails are crafted by the same team that was previously at Birch. 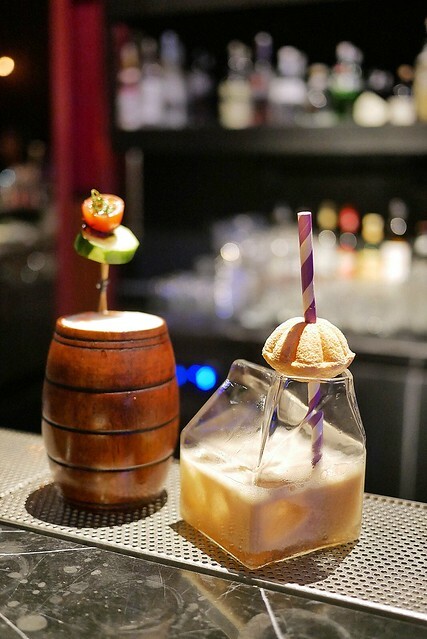 The cocktail menu also takes on inspiration from all over Malaysia. I had the Harvest Sour (RM42) – Dutch Gin matched with saccharine rambutan, biting grapefruit, frothy egg white, a kick of rice wine, and a surprising punch of curry. 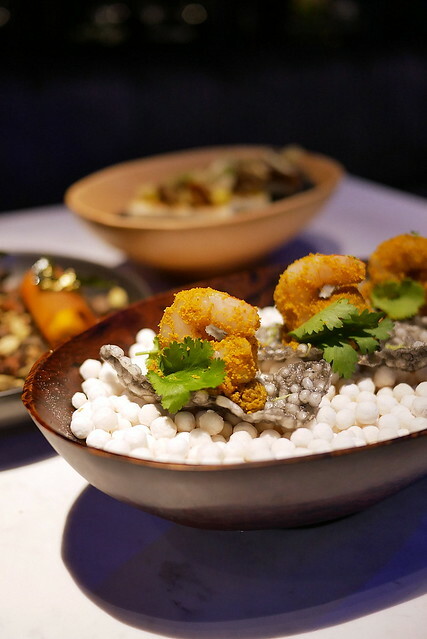 Beta KL’s cuisine is inspired by the four regions of Malaysia: North, East, South, and Central. We started with some small bites and a Spicy Garden Salad. 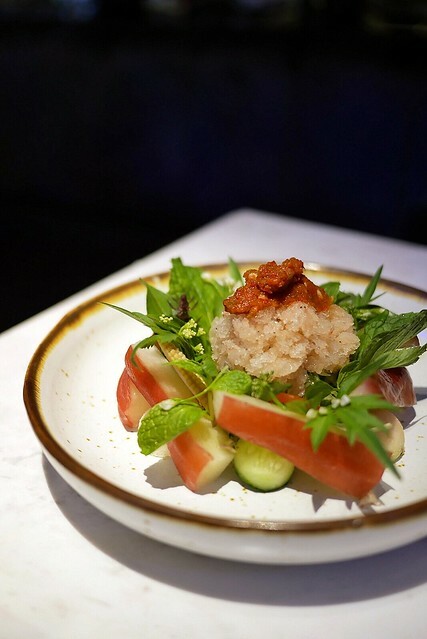 The local greens look like something that would come straight out from my mother’s garden, and went beautifully with some piquant sambal belacan, cincaluk granita, salted fish and pickles. So, so so good! 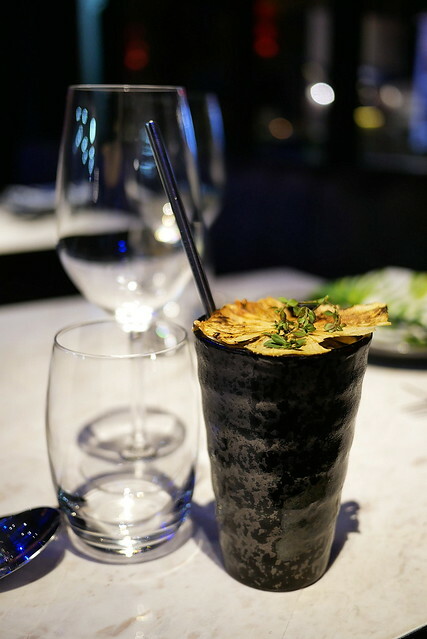 Sago (RM30) is made up of dehydrated squd ink sago crisp, deep fried shrimp, laksa aioli and calamansi zest. The flavours certainly remind us of a bowl of Sarawak laksa. Very interesting! The Inverted Karipap (RM 30) is a clever intepretation of our local favourite. Love the thin and crispy potato skin cylinder with a smooth and creamy citrusy inner. 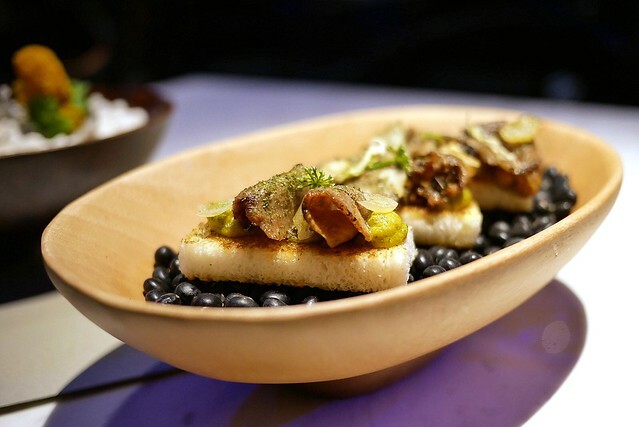 Served on a piece of crisy toast, Ox Tongue (RM27) is a spicy and flavourful dish. We thought that the ox tongue was a bit too chewy to our likings. 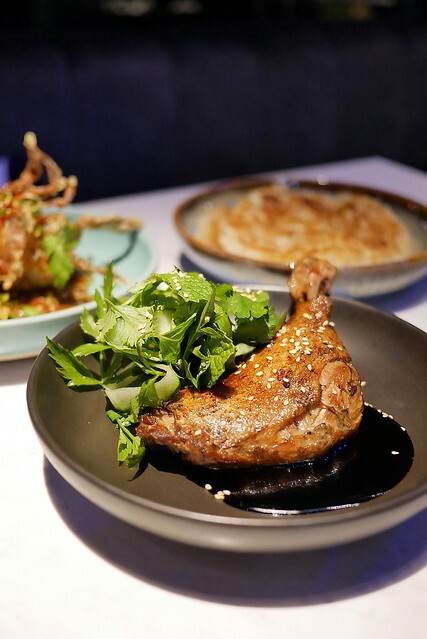 For mains, we tried the Duck Leg (RM 60) that was being cooked confit-style before being given an oil bath, resulting in crispy skin. 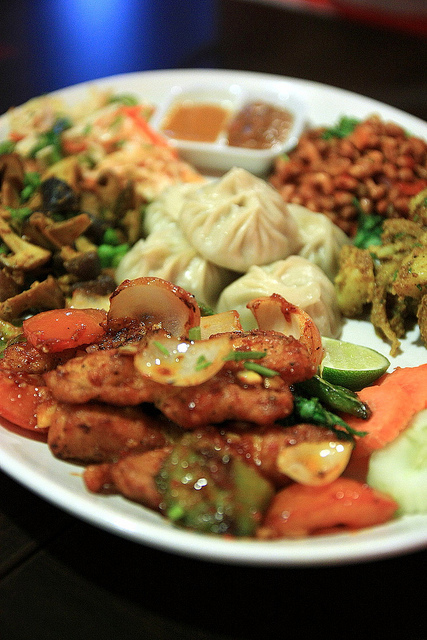 It is best eaten with the roti canai with a splash of hoisin sauce and some cucumber slices + corianders. 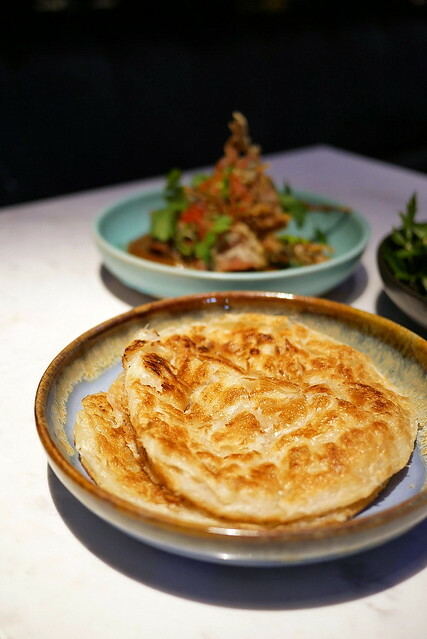 The roti canai here is as good as Raju’s – fluffy, super garing and crispy, not too oily. 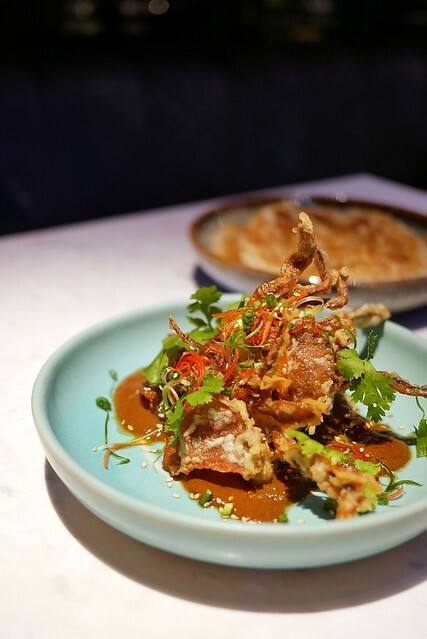 Crispy soft shell crabs (RM45) with chili crab sauce? You get the best of both worlds. The sauce was a bit too salty to be eaten on its own, but perfect with some white rice. 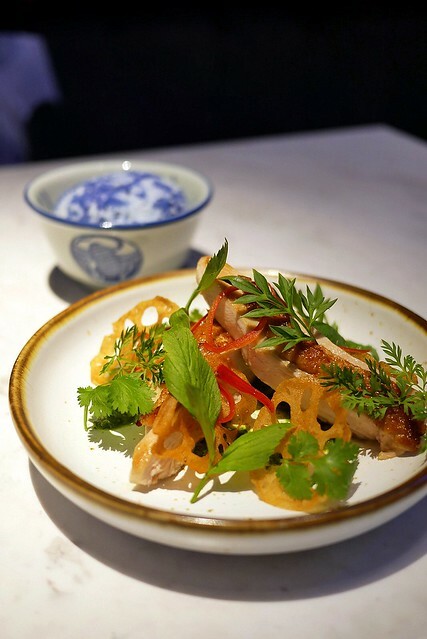 One of our favourite mains is Chicken (RM45). The chicken is being sous-vide to tender perfection, and then seared, skin side down for a crispy finish. Love the Bentong ginger pesto with kick, spring onion, crispy lotus roots and coriander too. We had it with a bowl of bunga telang rice, perfecto! We wrapped up our meal with two very interesting desserts. Banana (RM38) is a pretty looking dessert that tastes even better. Love the bananas rose made of dehydrated pureed banana. It is being served with rice, creamy condensed milk ice cream, and peanut crumble on the sides. If you are feeling luxurious, do order the Bird’s Nest (RM80) dessert. 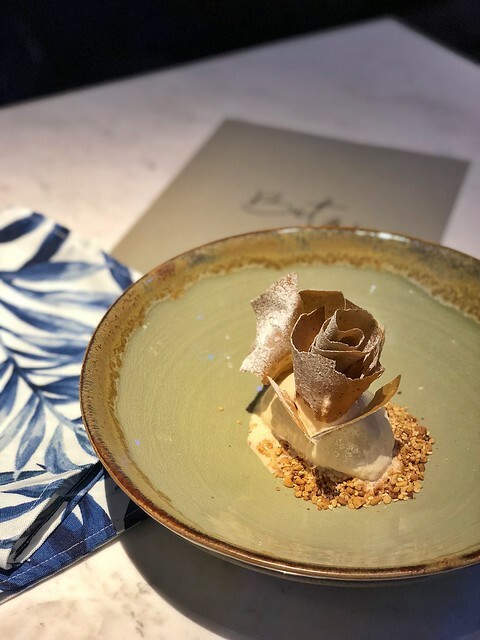 Chunks of bird’s nest together with some lychee granita are hidden inside the coconut sphere. 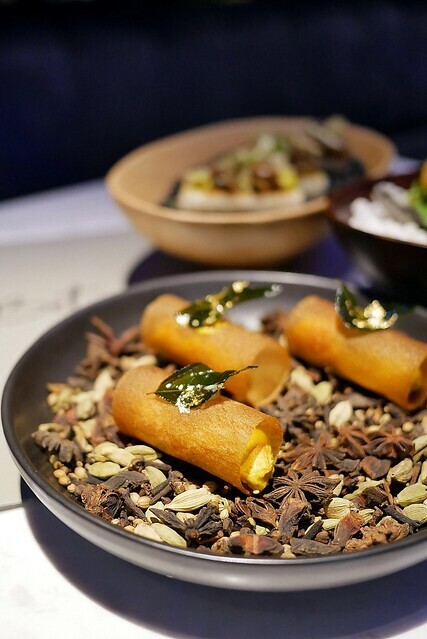 On its side are some bird’s nest jelly noodles, with finely chopped water chestnuts, goji berries and gingko nuts. 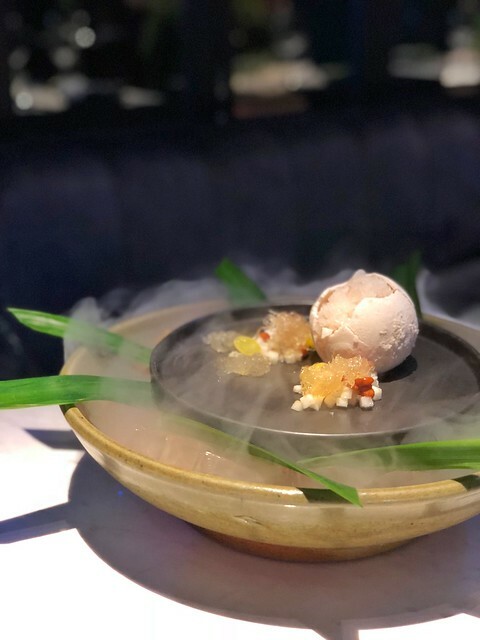 Love the presentation too, as it is being served with a pouring of liquid nitrogen over ice cubes for that mystical effect.